The Seahawks are one week away from kicking off the regular season. Two things stand in their way; final roster cuts and Thursday’s preseason finale against the Oakland Raiders. The Seahawks have a 2-1 preseason record and are coming off a 34-6 throttling of the Chicago Bears. The Raiders are 1-2 and are back home after losing in Green Bay last week 31-21. This is the 9th straight season the Seahawks conclude the preseason against the Raiders and this is the first time since 2010 that the preseason finale is played in Oakland. The starters will see little to no playing time in this game. I expect Russell Wilson and the starting offense to play only the first series. These are the players and storylines I will be watching before the Seahawks set their regular season roster on Saturday. The first defensive series of this game will likely be the only time our starting defense will play in full before the start of the regular season. Head Coach Pete Carroll is optimistic that middle linebacker Bobby Wagner and outside linebacker Bruce Irvin will be available this week. If that is the case, the Seahawks will start their entire projected starting defense against the Raiders. This unit will only see one series as a whole, with selected players possibly seeing expanded playing time. On the offensive side of the ball, I expect Russell Wilson will only lead one drive in the first quarter before turning the job over to Tarvaris Jackson and Terrelle Pryor. With the way the Seahawks have been playing so far in the preseason, is it too farfetched to expect the Seahawks to hold a 7-0 lead after the first two drives of the game? That is my expectation for the first quarter of play on Thursday night. The fourth and final preseason game is a job interview for many players on both teams. A strong performance in the preseason finale could be the difference between making the 53-man roster to start the season or getting cut. My main interests going into this game include a single player and an entire position group. On defense my eye will be on defensive end Benson Mayowa. Mayowa impressed coaches and fans in the 2013 preseason with 11 tackles and 3.5 sacks but he has been virtually nonexistent thus far this year, recording only 4 tackles and ½ of a sack. Mayowa is fighting to fit into the pass rush rotation but with O’Brien Schofield, Greg Scruggs back from injury, and rookie Cassius Marsh, there may simply be no room for him. I believe Mayowa must have a very strong performance against Oakland to even be a consideration to make our 2014 roster. 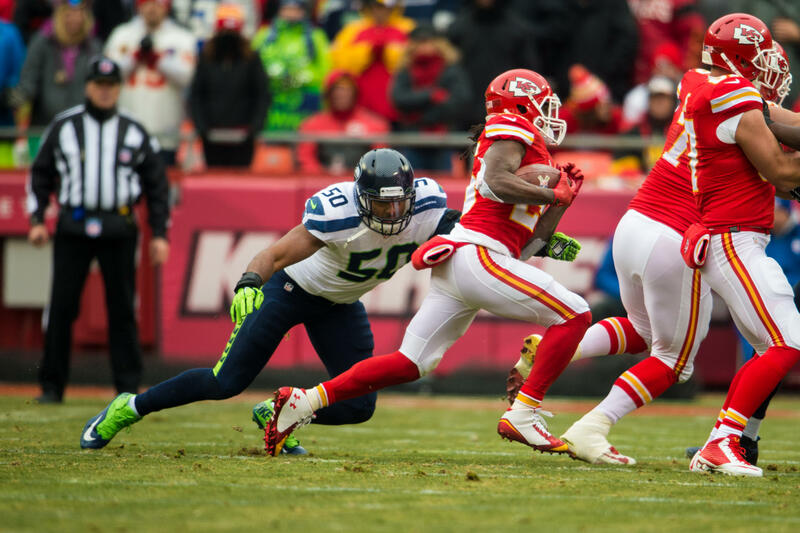 After the Seahawks selected wide receiver Paul Richardson in the 2014 NFL Draft, conversations started about the depth and talent the Seahawks have loaded at wide receiver. This catapulted discussions that by the end of the preseason some tough roster decisions will have to be made and the Seahawks will be forced to release some strong talent at the position. The Seahawks will likely only keep 6 wide receivers on the active roster. Percy Harvin, Doug Baldwin, and Jermaine Kearse are all presumed locks to make the team, leaving three spots up for grabs to 8 different receivers. In my opinion, the Seahawks will also hold on to Richardson and Ricardo Lockette which will leave one final spot to be won by Phil Bates, Bryan Walters, or fellow rookie Kevin Norwood. What makes this position group difficult to cut is that each player adds their own unique talents and traits. Lockette has shown flashes of good speed and hands on offense, Walters is a solid special teams contributor with kick return capability, and Bates is one of Russell Wilson’s most reliable targets in practice. I will be watching Lockette, Bates, and Walters closely this week on offense. The Oakland Raiders enter 2014 with an interesting mix of raw young talent and veteran leadership. The Raiders are led on offense by newly-acquired quarterback Matt Schaub however it will be rookie quarterback Derek Carr who sees the majority of playing time this week. The Raiders have also added offensive skill-position talent in running back Maurice Jones-Drew and wide receiver James Jones. On defense, the Raiders have added defensive linemen Antonio Smith and Justin Tuck to help a pass rush that was mostly ineffective in 2013. Oakland upgraded their linebacker corps by drafting Khalil Mack with the 5th overall pick in this year’s draft. The Raiders also upgraded their secondary by adding a pair of veteran cornerbacks; Tarell Brown and Carlos Rogers. All of these moves express the effort to improve a unit that gave up the 5th most passing yards per game last season. What makes this game hard to analyze is that even though we play the Raiders later this season, we will see a mere shell of the team that we will host on November 2nd, much like the shell of us that the Raiders will see this week. Seahawks/Raiders preseason matchups in past years have been mostly noncompetitive, with the Seahawks jumping out to a big early lead and holding it. If this game remains close later into the second half I believe that will point to the Raiders being an overall better team in 2014. Random Thoughts: My Seahawks uniform prediction this week: white jerseys with blue pants. Just a guess… For one last time Curt Menefee and Brock Huard have the call for Q13 FOX this week… This trip marks only the 4th time the Seahawks have played in Oakland since moving to the NFC West in 2002… The baseball infield will be present this week since the Athletics have not concluded their season yet. The Raiders are now the only team in the NFL who has to deal with the dirt infield for the first half of their season. It’s just another reason why the Raiders either need to build a new stadium or move to, say, Los Angeles?? ?… My guess is that the Seahawks will treat this week like a normal regular season game week since they start the season next Thursday. The Seahawks will likely play the Raiders on Thursday, watch film on Friday, trim the roster to 53 players on the off day Saturday, and begin practice and preparation for the Green Bay Packers on Sunday. Prediction: The Seahawks offense will drive down the field with ease and score a touchdown on their first series of the game. To counter, the starting defense will force Oakland to punt on their first drive of the game. The Seahawks backups led by Tarvaris Jackson will maintain the lead and the Seahawks will win, ending their preseason with a 3-1 record. The Seahawks will not light up the scoreboard like they have the past couple of weeks but they will hold a comfortable lead over the Raiders throughout the second half. Check back late Thursday night/early Friday morning for my game review. Enjoy the game and Go Hawks! The third game of the preseason is always the most important. It is the opportunity for the starters to play into the second half and this game gives fans possibly the best preview of how their regular season will play out. In this year’s edition of the “dress rehearsal” game, the Seahawks host the Chicago Bears at CenturyLink Field. The Bears are a perfect 2-0 in the preseason and are coming off a 20-19 win over the Jacksonville Jaguars. 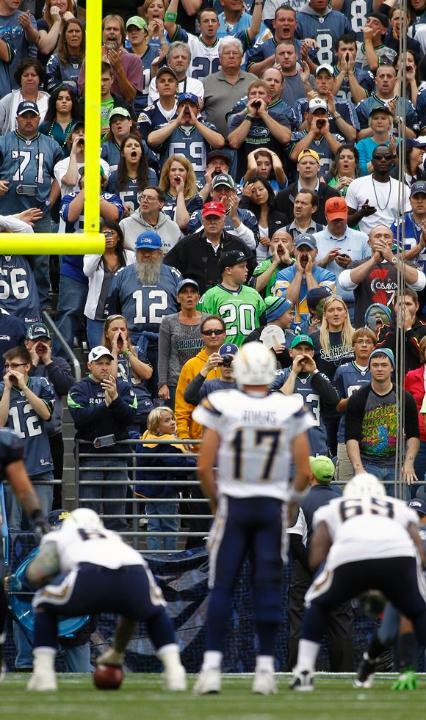 The Seahawks are 1-1 and are hoping to build upon last week’s dominant performance over the San Diego Chargers. Since the starters will play the majority of this game I expect a lot out of the Seahawks this week. Here is what I will be focusing on. 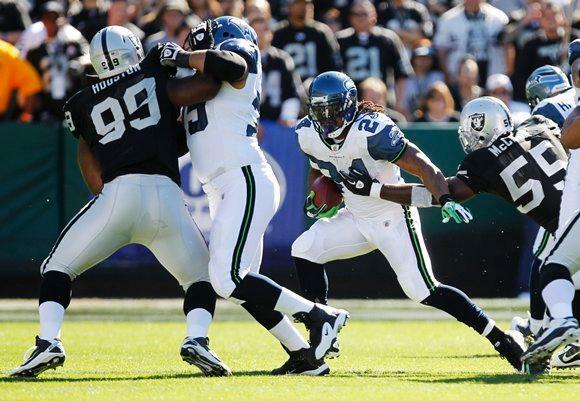 Last week I called upon Robert Turbin to prove he can be Marshawn Lynch’s primary backup. He impressed. Turbin will likely see the bulk of the carries again this week but my primary focus on offense is Russell Wilson and the passing game. Wilson has been on the field for just over one half of play so far this preseason and his play has been very good, going 15/19 for 158 yards and two rushing touchdowns. Although Wilson has a clean stat line, many of his throws have been conservative, moving the ball in smaller chunks. This week I want to see signs of an aerial attack that could make the Seahawks offense a powerful two-headed monster come September. The speed of the Seahawks receivers is crucial to making this happen. Percy Harvin, Ricardo Lockette, and rookie Paul Richardson should all play with Wilson in the game and I want to see Wilson taking shots down the field to these targets for large chunks of yardage. With a banged up Lance Briggs and Kyle Fuller unlikely to play, and rookie Brock Vereen patrolling the middle of the secondary, the Seahawks could be in prime position to take advantage of a Bears defense that will be somewhat depleted come Friday night. This week the Legion of Boom will play in full. The Seahawks defense has been missing strong safety Kam Chancellor for all of training camp and the preseason as he has been recovering from offseason hip surgery but this week Coach Carroll has said he expects Chancellor to play against Chicago. For how long remains to be seen. I expect Chancellor to be a bit rusty early on in the game but will settle down and it will be business as usual for the LOB. The Seahawks will still be without starting linebackers Bobby Wagner and Bruce Irvin this week but will hopefully have them back in time to play Oakland next week. Mike Morgan and Brock Coyle will likely start at linebacker once again this week. It will be crucial for the defense to play well early as the Bears are fully capable of putting points on the board. The 12th Man will once again have to be in mid-season form to help shut down Jay Cutler and the Chicago offense. This week I am interested to see who will see playing time after the starters are pulled in the third quarter. With the first round of roster cuts coming early next week, this game would ideally be the final chance for a select group of players to prove themselves before the first judgment day of the preseason. It is this reason why I expect to see members of the second-string units to see playing time with the starters. Once the starters are pulled in the third quarter, my guess is that we will see third-stringers and undrafted players get a chance to prove they are worthy of sticking around for at least one more week. On offense I expect to see wide receivers Phil Bates and Bryan Walters as well as offensive linemen Stephen Schilling, Caylin Hauptmann, and Garry Gilliam see their fair share of playing time in the second half. On defense, I would like to see D’Anthony Smith, Michael Brooks, Korey Toomer, Phillip Adams, and Steven Terrell get their chance to prove they are worthy of making the first round of roster cuts. The Chicago Bears come into this game undefeated on the preseason. The strength of the Bears offense gives the Seahawks a quality test for the starters to see in an expanded preseason opportunity. The Bears are led by quarterback Jay Cutler along with two of the best wide receivers in football, Brandon Marshall and Alshon Jeffery. Although the Legion of Boom will surely have their hands full with Marshall and Jeffery, the Seahawks defense will also have to take into account a newly signed Chicago wide receiver. This week my X-Factor Player to Watch for the Bears is wide receiver Santonio Holmes. Holmes is entering his 9th NFL season. Most recently he spent the past 4 seasons with the New York Jets. Holmes was signed over the past week and on Wednesday it was reported by ESPN that Holmes may see playing time this week. If Holmes does see game action I am interested to see how the Bears use him in their pass-heavy offensive scheme, because it will be difficult for the Seahawks to prepare for Holmes’ presence on the field; something that is currently a complete mystery. Random Thoughts: The Seahawks will wear blue jerseys and blue pants with the Bears likely wearing white jerseys and navy pants. It has been 5 years since the Bears last played in Seattle. 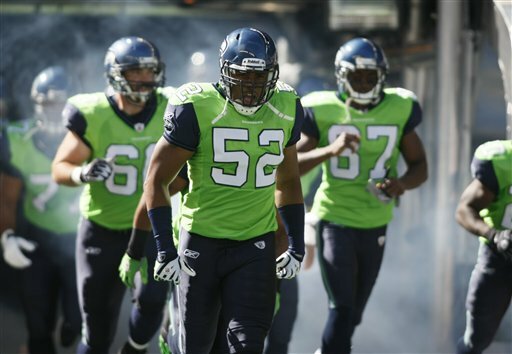 On that September Sunday the Seahawks wore these. Thank goodness we have graduated to our amazing Nike uniforms since… Curt Menefee and Brock Huard have the call for Q13 FOX… Bill Leavy is the referee this week. Even though we finally got our first Lombardi Trophy, I will never forget how Leavy and his officiating crew ruined Super Bowl XL… My back is feeling better so hopefully I’ll be able to handle my medicine accordingly and have a couple of beers before the game, as I am meeting up with a small group of friends… The offense will likely be introduced this week after the defense was introduced last week… I do not expect any championship banners unveiled this week but it looked like a banner was going to be revealed last week, so I could be wrong… I may have to make it a gameday tradition to visit the Lombardi Trophy at Touchdown City before every game. Seeing it before last week’s game got me pretty emotional… I could not even begin to guess who will raise the 12th Man flag this week. My guess is a popular former Seahawks player… In two weeks we open the regular season at home. I can hardly wait! 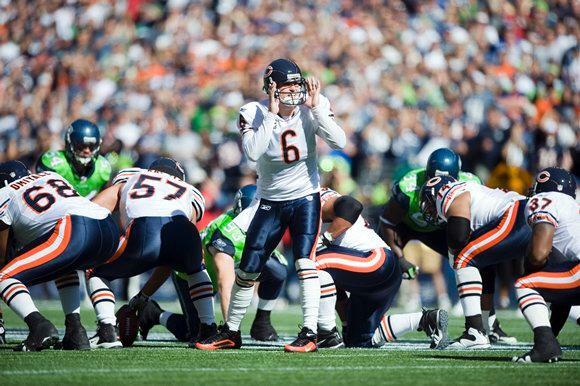 Prediction: The Seahawks and Bears will trade touchdowns in the first quarter before the Seahawks start to pull away. Russell Wilson will throw for two touchdowns and Christine Michael will also add a touchdown later in the game. The Seahawks will improve to 2-1 with the preseason finale against Oakland looming next week. Check back late Friday night/early Saturday morning for my game review. Thanks for reading and go Seahawks! The Seahawks will play their first home game since winning Super Bowl XLVIII Friday night as they host the San Diego Chargers. The Seahawks are 0-1 in the preseason and are coming off a 21-16 loss last week at Denver. The Chargers on the other hand got off to a strong preseason start last week, defeating the Dallas Cowboys 27-7. Like last week’s game against Denver, this will be the first of two meetings between the Seahawks and Chargers this season; these two teams will meet in San Diego week 2. This week’s game is simply a building block. I am looking for Seattle to improve areas where they struggled greatly last week. Here are my areas to focus on this week. This week I want to see the Seahawks move the ball more effectively on offense. There are several parts to making this happen. First, I want to see better play from the offensive line. Last week the Seahawks started only one offensive lineman who started in 2013, J.R. Sweezy. Russell Okung, James Carpenter, and Max Unger all returned to practice this week however it is yet to be seen if these three will see any playing time Friday night. The backup linemen also did not help in the running game last week, as quarterback Terrelle Pryor had to rely on his own feet to pick up yards. Secondly, I want to Robert Turbin to take a firm hold of the backup running back job. Last week Turbin had almost the same number of carries as yards. 5 rushing yards on 4 carries is absolutely not making the most of your opportunity and I think another poor showing by Turbin could open the door for Christine Michael to jump up the depth chart. I feel that Turbin is due for a breakout preseason performance but if he fails to show his worth for the second straight week, we could be entering the second half of the preseason wondering if Robert Turbin is even worthy of making the 53-man roster. This week is round two of the Tarvaris Jackson/Terrelle Pryor battle to see who will be Russell Wilson’s backup come September. Jackson will likely see action in the second and third quarters with Pryor coming in to finish the game. This week I want to see the offense finish strong, meaning I want to see drastic improvement from Pryor. Last week Jackson took what I believe to be a significant lead over Pryor in the race to be the backup quarterback and a strong performance by Pryor against San Diego will put him back into the conversation, after he took himself out of it last week. With Russell Wilson likely playing into the second quarter, I believe Jackson will see minimal work with Pryor playing the majority of the second half. My honest hope is that the Seahawks are either in a close game or trailing late in the game in order to give Pryor a true pressure packed situation to cut his teeth on, much like last week. On defense this week there is one overlying thing I want to see. This will be the first time many of our backup defenders get to play alongside the 12th Man. I want to see these players along with the rest of the defense feeding off the energy of the crowd. Last week in Denver the Broncos defense fed off their crowd all game long and it seemed to make a noticeable difference in the way they played. The starters will play the majority of the first quarter, possibly even into the second quarter before handing it over to the young backups. My goal is for the Seahawks second half defense to give up a maximum of 10 points. If Seattle can hold them to single digit points, we will likely walk off the field victorious and it will have me breathing a sigh of relief that our backups are better than what they showed last week. The San Diego Chargers surprised many people last year, compiling a 9-7 record and making it to the AFC Divisional playoffs. A big reason why they were so successful was the resurrection of quarterback Philip Rivers and the addition of wide receiver Keenan Allen. Despite their offensive success last season, San Diego has maintained all of their skill position players from last season. Wide receivers Allen, Malcom Floyd, and Eddie Royal are likely to make the team but the race for the last couple wide receiver spots is up for grabs to a plethora of players. My X-Factor Player to Watch for San Diego this week is one of those backup receivers, Dontrelle Inman. Inman is currently listed as one of the Chargers third-string receivers but he made the most of his opportunities last week. Against Dallas, Inman caught 3 passes for 107 yards including a 70-yard touchdown grab. Inman is sure to see his share of playing time against the Seahawks and it will likely be up to cornerbacks Jeremy Lane and Tharold Simon to stop him. Random Thoughts: The Seahawks will wear all blue this week. The Chargers will likely wear white jerseys with navy pants… Pete Morelli is the referee this week… Curt Menefee and Brock Huard have the call once again on Q13 FOX this week… The preseason bores a lot of people but I honestly LOVE the first preseason home game. I get to be back in my seat for the first time in 7 months and it gives me the opportunity to catch up with everyone I sit around… I am wondering how and when the Seahawks will unveil their 2013 banners. It is obvious that we will unveil our 2013 world championship banner before the Packers game, but will we reveal the other two banners (NFC West champions, NFC Champions) in the two preseason games leading up to NFL Kickoff 2014? If so, the Seahawks will likely raise the 2013 NFC West championship banner this week. If not, we will probably raise all 3 before we play Green Bay… I am on antibiotics for the next week-plus so I am obligated not to prefunk both of our home preseason games. I’ll have to figure out a different fun pregame plan… I am glad the weather is going to cooperate this week. The worst thing is to have to bring a sweatshirt to a game being played in a warm weather month… I think this is the first time in the 9 years I’ve been a season ticket holder that we are playing a preseason home game on a Friday night. It will be nice to attend then have the rest of the weekend free. Prediction: I think that the Seahawks will start the game on defense and force a Philip Rivers interception. Russell Wilson will lead two scoring drives in the first quarter and the Seahawks will have a solid lead after the first quarter. San Diego will tie the game in the third quarter but the Seahawks will take control of the game late, as Terrelle Pryor will scamper for a touchdown midway through the fourth quarter. The Seahawks will go to 1-1 on the preseason and will get ready to host the Chicago Bears next week in the “dress rehearsal” preseason game. Check back early Saturday morning for my Chargers game review. Enjoy the game and for those of you attending, have fun. Go Hawks! Six months ago the Seahawks wrapped up the best season in franchise history, winning Super Bowl XLVIII. 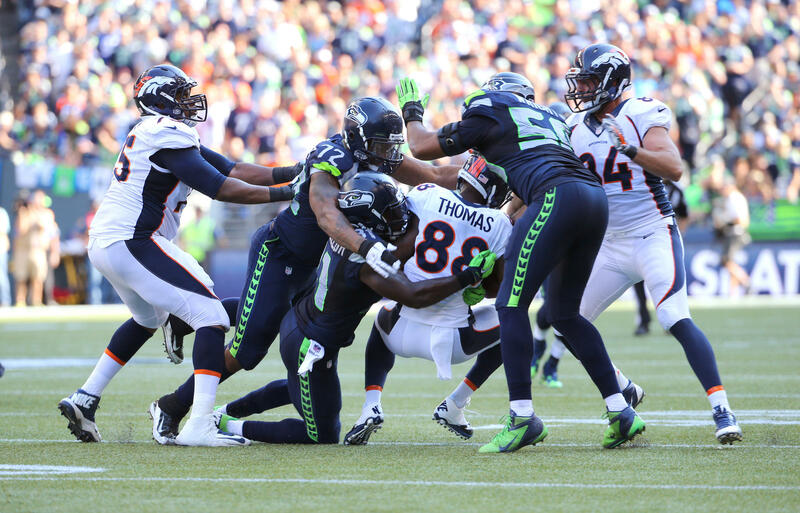 The 2014 season starts against the same team that we ended our 2013 season against as the Seahawks head to Denver Thursday night to play the Broncos in the 2014 preseason opener. 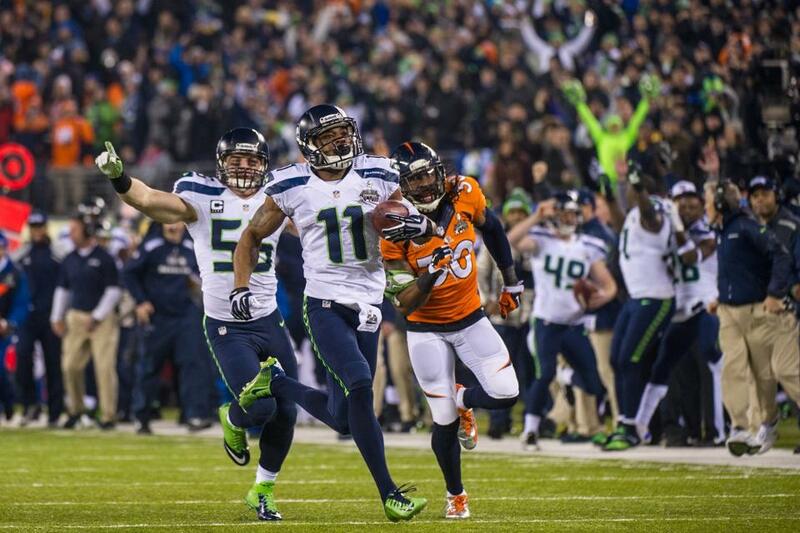 The Seahawks defeated the Broncos in the preseason last year, winning in convincing style 40-10 at CenturyLink Field. This will be the first of two games against the Broncos in 2014; the Seahawks and Broncos will meet in week 3 of the regular season in Seattle. Although this is only a preseason game there are many things to keep an eye on. Here are a few of the things I will be focusing on this week. Seahawks training camp has been going on for two weeks. With the first live game action since February on deck, it is reasonable to expect that the first team offense and defense may come out a bit rusty. That is what the preseason is for after all; to shake the rust off and get ready for the regular season. I am very interested to see a couple of different things on offense. First I am interested to see what kind of protection Russell Wilson gets in the passing game. If the unofficial Seattle Times depth chart is accurate, the Seahawks will start 3 linemen that did not start in 2013. Alvin Bailey is projected to start at left tackle with Caylin Hauptmann at left guard and rookie Justin Britt at right tackle. With this questionable offensive line, I could see offensive coordinator Darrell Bevell using wide receiver Percy Harvin on quick throws or sweeps, especially if Wilson is feeling the pressure at the beginning of the serie(s). The second thing I want to see on offense is how running plays will be split between Robert Turbin and Christine Michael. I do not expect to see Marshawn Lynch until maybe next week against San Diego, so Turbin and Michael will see expanded playing time on Thursday. Turbin is listed ahead of Michael on the depth chart but it would not surprise me to see an alternating committee instead of Turbin playing with the second team offense and Michael playing strictly with the third team offense. The Seahawks defense has made a name for themselves as being one of the deepest units in the NFL as a whole. Over the past couple of seasons backups such as Malcolm Smith and Byron Maxwell have taken advantage of the opportunities presented to them while solidifying themselves as reliable starters. On Thursday defensive backups will get their first opportunity to make a name for themselves and for some, prove that they are simply capable of making the 53-man roster. The Seahawks are projected to start Mike Morgan at outside linebacker and rookie Brock Coyle from Montana at middle linebacker. Coyle will start over incumbent special teamer Heath Farwell, which shows how far Coyle has progressed during training camp. This will also be the first time the Seahawks show off their (semi) new look defensive line. Chris Clemons and Red Bryant are now in Jacksonville, which opens up both starting defensive end spots to 2013 rotational players Cliff Avril and Michael Bennett. The Seahawks pass rush package now consists of Avril, Bennett, Bruce Irvin (who will not play on Thursday) and rookie defensive end Cassius Marsh. The Denver Broncos are coming off one of the most impressive statistical seasons of any offensive unit in NFL history. After breaking numerous passing records, yet getting embarrassed by the Seahawks in the Super Bowl, Denver spent a large amount of money in the offseason upgrading their defense with veteran talent. After the Seahawks defense only allowed 8 points to Denver in the Super Bowl, the Broncos made these moves in free agency to counter select NFC powers such as Seattle and San Francisco. The Broncos signed outside linebacker DeMarcus Ware and cornerback Aqib Talib among others to improve the Broncos pass rush and secondary respectively. From a Seahawks perspective, I view this game as a hollow preview of what could be coming when we play Denver in the regular season. I am curious to see just how improved the Broncos defense is compared to last season. My X-Factor player to watch for the Broncos this week is rookie cornerback Bradley Roby. Roby is the Denver’s 2014 first round draft pick and is currently slotted behind Aqib Talib on the depth chart. Roby has been playing really well during training camp and will likely see significant playing time on Thursday, especially later in the game. Random Thoughts: This will be a mini uniform rematch from Super Bowl XLVIII. The Seahawks will wear white jerseys and the Broncos will wear orange jerseys with white pants. The Seahawks pant color has yet to be announced but it would not surprise me at all if we wear blue pants just like in the Super Bowl… I am glad we get Denver at home in the regular season. We will see three of our preseason opponents in the regular season and in each instance the location of the game is different from the preseason to the regular season… I am curious to how the Seahawks will be received in Denver as the team that just beat the home team in the Super Bowl mere months earlier. I imagine it will be as hostile an environment as possible for a preseason game… Tony Corrente is the referee for this week’s game… Curt Menefee and Brock Huard have the call for Q13 FOX this week. Menefee and Huard will call all 4 Seahawks preseason games on television this year. As always, the score and the outcome in the preseason does not matter. The only thing that truly matters is that we can fly home injury-free. If the Seahawks can avoid sustaining any major injuries we will have already won heading into another week of training camp. Prediction: I think that the Broncos will be as fired up as possible coming into this game. They want to stick it to us after we embarrassed them back in February. I could see the Seahawks starting the game with the ball and struggling early. If the Seahawks win this game, I expect it to be on the arm and legs of a much improved Terrelle Pryor. The Seahawks have not lost a preseason game since 2011 but I believe our 10-game preseason winning streak will come to an end this week. The final score will be close but the Broncos will be able to do just enough more on offense to walk away with the victory. Check back on Friday for my review of our preseason opener, as well as an early preview of the week ahead as we get set to host the San Diego Chargers next week. Enjoy the game everyone. Go Hawks!